EventHire Blog Read:Furniture hire or buy? 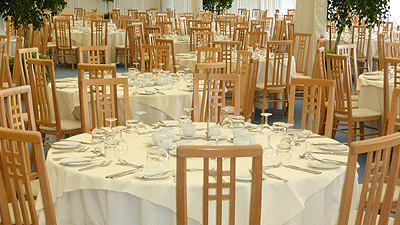 One of the decisions that many event organisers have to face is whether to hire furniture or buy event furniture. The answer as to which one is best very much depends upon a multitude of factors. Buying furniture involves a large initial investment which yes, you might make back over a period of time. However, hiring furniture means that you can be specific for each event that you put on, always ensuring that you have enough chairs and tables for example, down to the last guest. If you buy furniture, of course, you also have to factor in storage costs. It’s all well and good investing in furniture and then having it at your events, but what about in between events? You have to find somewhere to store the furniture……and storage costs money! When you do furniture hire with a company, you are simply hiring furniture for your event and, in the case of Event Hire UK, this is delivered the day before and collected the day after, and if you specify, even delivered and collected on the same day, saving you any storage costs at all. And what about maintaining your furniture. Furniture products such as banqueting chairs, for example, do get worn on events such as weddings and corporate events, and so you will need to give your furniture some TLC over a period of time. Do you have the facility and ability to do this to a professional standard? If not, then the chances are that you will need to pay someone to do this for you – again, an added expense. Furniture hire companies such as Event Hire UK, for example, have a refurbishment facility on site to ensure that the chair hire products are refurbed and resprayed in between hires to ensure that our clients receive the best quality hire chairs at each and every event. And finally, with the best will in the world, it’s almost impossible to predict what your clients will want. If you are a marquee company, for example, what happens when you go and buy 100 limewash Chiavari chairs, but the client wants white Chiavari chairs. What happens if you go and buy an LED bar, but the client wants a specific design of mobile bar hire? And what about if you buy a black and white checked dance floor, but the clients wants just white?! So, whilst the decision to buy furniture or hire furniture is down to you and your types of events, it is often a case that furniture hire rather buying is the preferred option for many. Working with a reliable furniture hire company and the teams there is worth a lot, especially in the run up to a busy event, and so you need to find a hire company that you can trust! Event Hire UK offers the complete range of furniture hire products at great prices, and so why not give us a try today – you won’t be disappointed!